On Saturday morning, Newmarket Joggers enjoyed a social gathering at Brandon parkrun, later tucking into a waffle breakfast at a restaurant nearby, organised by Jeremy and Emma Reader. Crouching left to right (see photo): Jenny Osbourn, Caroline McIntosh, Jeremy Reader with son, Rachael Maltpress. Standing left to right: Jim Withers, Sarah Kinston, Brian Munns, Adam Maltpress (behind), Paul Dockerill with daughter Chloe, James Thomson with daughter in arms, Rebecca Fordham, Jan Holmes, Hannah Parsons, Baz Colley, Giles Macrow, Henry Hamilton, Belinda Schofield and Clive Purbrook. This Saturday will be the 250th parkrun of James Thomson, so all are invited to Wimpole Estate parkrun on March 2nd. 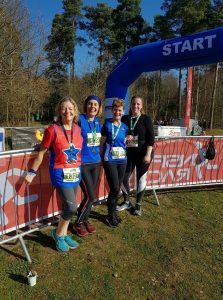 On Sunday, the third and final leg of the Thetford 10K Trail Run series attracted 440 runners to High Lodge in Thetford Forest, among whom 6 Joggers were taking part. Jan Holmes scored a 10K PB of 54:45, especially impressive when gained off-road, finishing first of 20 in her FV55 age category and 38th of 252 female runners. This puts her up from Silver to Gold standard in the 2019 club achievement tables. For the men, Adam Maltpress (43:59) was first home, finishing 7th of 58 in his MV40 age group and 27th of 440 runners overall. Other Joggers to finish were Andrew Taylor (46:45), Sianie Painter (58:48), Sarah Kinston (64:01) and Orla Dockery (65:20). Down in Hertfordshire on the same day, Henry Hamilton-Gould competed in the Baldock Beast Half Marathon, coming home 40th of 372 runners in a time of 1:36:07, his first half marathon this year. He was running at a controlled pace, hoping to save his best effort for the club’s favourite race, the Cambridge Half Marathon on March 3rd, for which no less than 64 Newmarket Joggers are registered to run. Also on Sunday, in lovely sunshine at the Beyton School Campus near Bury St Edmunds, it was the Tarpley 10 and 20 mile events, named in commemoration of St Edmund Pacer Bert Tarpley. Clive Purbrook completed the 10 mile race in 1:24:25, close to his best time earlier this year, while Paul Dockerill (2:33:11) was well up with the pace in the 20 mile event. Also running in the 20 were Caroline McIntosh (3:59:28), who did well to duck under 4 hours in her first competitive 20 mile race, and Chris Aylmer (3:28:45), a few seconds from a PB. After the Tarpley race awards, the Suffolk Grand Prix age category prizes for 2018 were presented. Malcolm Osbourn and Chris Aylmer both received runner-up trophies for MV70+ and MV65 respectively.